So, I designed a logo in CMYK color and printed it using EPSON printer. The colors match perfectly what I see in print and on monitor. Then I convert the logo color to PMS using Illustrator's automatic conversion tool, the colors on screen pretty much stay the same, but then when I take out my Pantone color swatch book and compare the colors, there is significant difference in hue and shade between what I see on screen and print, with the Pantone swatch book in my hands. How do I deal with this issue? Should I just manually grab my swatch book, and try to closely match the colors to the printed logo and apply those numbers to the logo on screen? Here is the rub, if I do that, the logo on screen changes in hue and shade and looks nothing close to the CMYK logo on screen and print. So the question is, when I provide logos to the client should I provide one in CMYK color, and one in PMS color? And when the client asks "why do they look a little different in hue and shade?" I tell them "Don't worry, once that PMS logo is printed on a press it will closely resembles this CMYK logo that you see." Yes. You provide both a CMYK and Pantone color build of a logo, as well as an RGB/Hex build, to the client. Whether a client asks for it or not a professional's job should be to provide everything the client needs, even if the client is unaware they need it. When I start adjusting the color of a logo I am designing I use Pantone colors. The reason being that, in practice, a Pantone color is always going to be that color when reproduced professionally. So, I want to design with the most common denominator. After I settle on coloring, I look at conversions. I never trust any software to convert the colors for me. Software can be pretty accurate most of the time. But there are cases when it isn't. Software can be wildly inaccurate in some cases. I mean wildly. I've seen a yellow become a green when allowing software to automatically pick a closest CMYK color referencing a Pantone color. So I start with something like Pantone 248... allow software to convert it to CMYK.. then adjust the CMYK values to better suit my personal preference. In this case I see the software conversion wants to use 2% of black. But no commercial press is going to hold a 2% screen very well. At a minimum a 2% screen is going to be difficult to maintain. So, I personally adjust to remove that 2% black screen, adding a touch more cyan to compensate. I then allow software to automatically convert my CMYK choice to an RGB choice. CMYK to RGB conversion is generally more accurate than spot to process or process to spot conversions. This all may seem like it's being too meticulous. However, when you see colors next to each other, there are subtle variations. There are differences visible in the image above, but they are exceptionally minute. A poorly calibrated monitor may not show them. For me, these subtle variations are a great deal of WHY I'm picking colors. And I need to ensure that, given the variations, my client has access to the color I feel works best. So, to that end, I provide clients with CMYK, Pantone, and RGB files for their logo in every instance whether they know they need them or not. If a client mentions something about why colors look slightly different, I then explain to them the various color builds and why some colors are not absolutely achievable in some color models. And I explain the efforts I take to ensure they get as close as possible in every use case and how it's just not possible to use Pantone colors on the web and for every print production run, largely due to costs. I also tend to only provide RGB color files if the client is approving digitally and only provide CMYK colors if the client is approving physically. Sending a client a CMYK PDF to view on their monitor is going to inevitably bring up the color issue. And sending spot color proofs will result in other issues depending upon what software they use to view the spot color proof (Apple's Preview application, and many web browser plug ins, won't render spot colors at all accurately in a PDF). As for you printing Pantone colors to an Epson printer... well you aren't. Pantone is an ink system. Epson printers don't have Pantone ink cartridges. 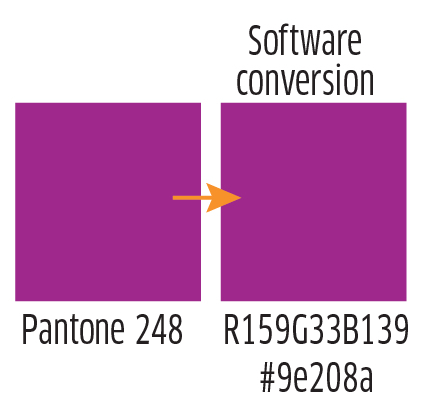 If you print a Pantone color to your Epson printer, it's being converted by the printer driver to CcMmYyK for printing, or even converted to RGB then converted a second time to CcYyMmK for printing. PMS is an ink. It is one color. 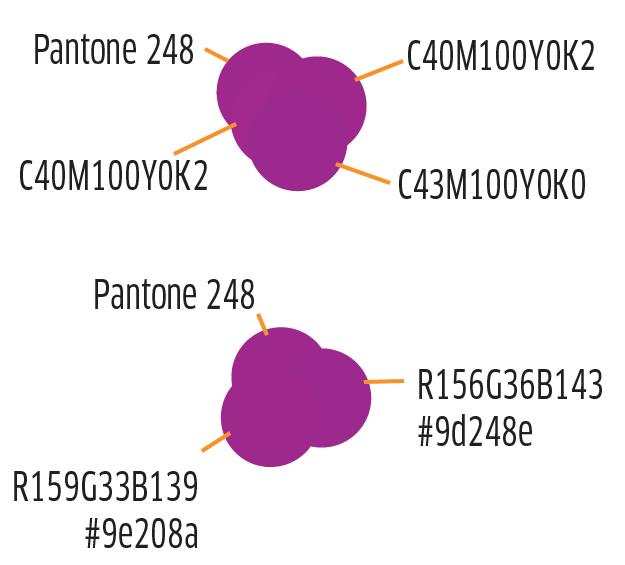 If you print a PMS color, and the print provider is actually using the Pantone ink system and they mixed the ink correctly, it will match the swatch from your book. If you are picking a CMYK process of a PMS book swatch, you are not printing a PMS color. If you are not running (and paying for) a separate plate and ink for that PMS color, you are running a job with 4 color process and there are no PMS colors (all spot colors have been converted to process). If your logo will never be printed using a separate spot color, it will never be a PMS color. If the second paragraph (above) describes what will happen, then do not specify a PMS color for your client, since you are simply trying to match a swatch to a CMYK color, this is the opposite of the intention behind Pantone PMS to begin with. One thing that gives me pause in your question: you say your (consumer-grade?) Epson matches your screen. You should be calibrating your systems to match what an actual paid commercial print job result will be, otherwise you might be in for a rude awakening when your purple is mud brown and your greys are pink. You should be getting a proof of your stuff from an actual print provider from a calibrated output device. It is worth it to spend 25-50$ to ensure your workflow is "trusty" enough to pick colors on-screen. You should never send PMS colors to anything other than an offset press. You use the CMYK breakdowns for each PMS when proofing and sending to clients. The same goes for spot colors. That being said here are some steps you can take to ensure you get the closest possible match. Keep in mind that it's normal that your printer will not render the color exactly the same. There's a few things along the way that will make it almost impossible for you to match perfectly your logo on every printer you'll use; sometimes the Pantone color recipe will be respected/matched, sometimes converted by the software and printer, sometime to something RGB, etc. That's why you need to stick to one version and the most reliable for printing and most offset projects is CMYK on projects in full colors. I'm not really sure why you are converting the whole logo to PMS. Most press operators don't print PMS if they can avoid it. It's a lot of work and is usually only done when you 100% NEED too hit a color; take Coke Red or Pepsi Blue for example. I am afraid you did this backward. It is a happy coincidence that your settings on your monitor and your combination of paper and Epson inks gave the same result, or probably this is simply because of a localized settings on your computer. Unless you calibrated your monitor there is nothing on the planet that assures you that the logo will look the same on another monitor, or another printer. This is evident because the patches do not correspond to a standardized print, aka Pantone book. So you have faced your first problem. The combination of colors only match your initial print, but failed on the second test. If you send this values to your client they will fail again and again. A CMYK has NO meaning regarding on what color is that. The actual color depends on the color profile used, the type of inks, the paper used. That is why you need to use a standardized color and then adapt your monitor and print to that standardized color... calibrating your equipment. I do not love Pantone system, but in this case is one of the best standardization of colors, so your logo should be in this case first defined as a Pantone and then converted to CMYK using a specific color profile. But the good news is that you can arbitrarily choose a new PMS color. Grab your Epson print, grab a Pantone color guide and choose one you like most. Not the answer you're looking for? Browse other questions tagged print-design logo color-conversion pantone color-reproduction or ask your own question. How do I identify text layers as individual PMS colors? Is there a way to get a spot color that's not in my Pantone book?